To understand fallout formation from a nuclear explosion, it's important to look at the gas phase of metal oxides within the device. "We showed a quantifiable link between recovered particle size distribution and gas phase chemical kinetics—a consideration that is absent in the current fallout formation models." said Batikan Koroglu, LLNL postdoctoral researcher and lead author of the paper. 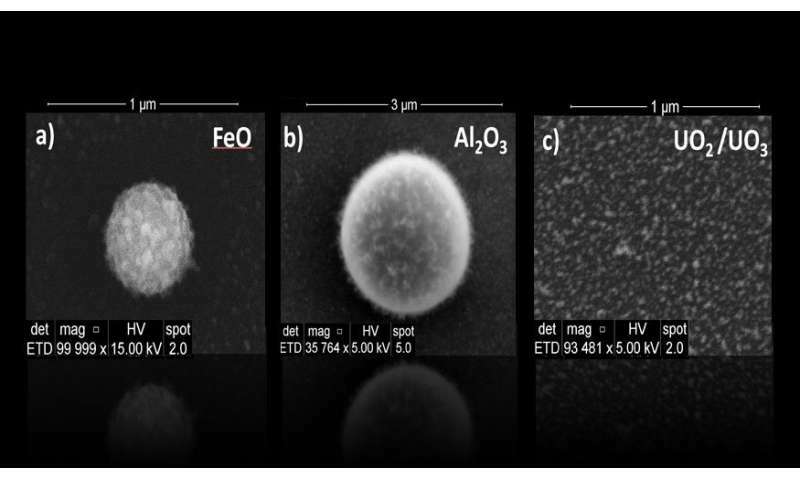 The team's plasma-flow reactor allowed them to monitor the gas phase chemical evolution of three types of metals (iron, aluminum and uranium) leading to nanoparticle formation using in-situ optical spectroscopy and ex-situ electron microscopy measurements. These three metals were chosen because their oxides exhibit very distinct volatilities. "Understanding the gas phase chemistry of recombination reactions is necessary to accurately describe the condensation patterns observed during the fast cooling of a nuclear explosion," Koroglu said.